NEW directorships are nerve-racking enough for the experienced, never mind a first-appointment novice. No one wants to look stupid or "lose face" at the first board meeting. Nerves are natural and the best antidote is proper preparation. New-director formalities include observing due process: signing your "Consent To Act" form as director and filing your appointment with the relevant authorities. This may sound obvious but mistakes do happen. You also have to give notice of your interests in transactions, shareholdings, and your other boards and appointments in accordance with Section 156 of the Companies Act and other regulations. Additionally, ensure that you have received a formal letter of appointment stating your duties, obligations and basis of remuneration, and adequate professional indemnity insurance. Your first board meeting at any new company is like the first day of school: it is best to be prepared for it. Meet your chairman and chief executive officer ahead of time for a better understanding of the board, expectations and cultural idiosyncrasies. It also helps to research the background of other board members, if only to avoid the awkwardness of expounding on a topic before a noted expert. An orientation programme for new directors is critically important for understanding the business and the "live" issues that currently consume the company and the board. If there is no detailed orientation programme scheduled for you, ask for one, or request to meet key management personnel for separate briefings before the first board meeting. A visit to the company's major business entities and its places of operation before the meeting can provide a relevant and informed premise to read the board papers intelligently. Read the board papers carefully, spend time to understand the company's financial and delivery models. The day of the meeting is not the time or place to "wing it". In addition, familiarise yourself with the Code of Corporate Governance, and the company's latest Annual Report, financial results announcements and Articles of Association. For starters, be prompt for your first meeting, and for all future meetings. And dress the part. You are there for your experience and knowledge, so actively participate in all strategic decisions. Where necessary, pose questions - politely - based on informed knowledge. Aggressiveness can alienate management and fellow directors. A meeting ending in conflict achieves little. Listen carefully for cues on how the board dynamics work. Avoid entanglements over operational details. The board is seeking the wider, strategic view from you. As a new director, you bring a different set of life and work experiences. Be positive. Try not to be a nuisance of a newcomer. 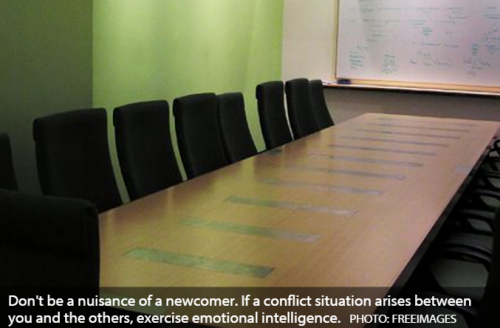 Should a conflict situation arise between you and management or fellow directors, exercise emotional intelligence. You should always be constructive and adapt to the organisation. In all this, be mindful of your fiduciary duties and the need to exercise reasonable care, skill and due diligence. Consult with professional advisers such as lawyers, accountants and consultants if you have any issues. The ability to do this and for the company to pay the costs should be enshrined in the Articles of Association, by-laws or terms of reference of every board and board committee. Using professionals to some extent can protect you should something go wrong in the future. Be wary of thick reports handed to you at the meeting, requiring an immediate decision; management could be trying to push something through. Take enough time to consider issues, and if you feel rushed, delay any decision. Do not be a rubber stamper; it may be an easy way out but it could come back to haunt you in the future. Pay attention to governance protocol. A proper record of all decisions is mandatory to support what was agreed at the board meeting. This is essential in cases where problems may arise at a future date. Draft board minutes should be circulated to board members for their input before they are finalised and formally put to the board at its next meeting. It is worth emphasising that all directors should read the draft minutes. They should not hesitate to insert comments or questions they recall making at the meeting if it is useful or material. Do not expect the company secretary to keep detailed or accurate minutes. After your first meeting, you may request time with the chairman to receive feedback, or ask for a more detailed view of the organisation's audit or risk practices. Secondarily, try and plan your board meetings at least a year in advance to prevent conflicting schedules. Poor attendance is not only noted by fellow directors, but is usually reflected in the Corporate Governance reports. Some boards also link directors' remuneration to attendance at meetings. In the final analysis, an independent director's role can be a fantastic experience or an unmitigated disaster. It all depends on the professionalism, commitment and integrity of the director.